We're not making a statement on the overall intelligence of the latest Toyota microcar, the Toyota IQ, but rather a statement on its similarity to a certain other car. In addition to Toyota design and, hopefully, Toyota value, this smallest of cars has a serious advantage over that other intelligent ride: seating capacity. The IQ has a unique 3+1 seating arrangement which makes it suitable for three adults and one child (or two comfortable adults, one contortionist and a magical elf). Price and power are still a mystery, but they're planing production for late 2008 with 100,000 units sold globally. Press release and more pictures below the jump. Toyota is world-premiering the production design of the new iQ at the Geneva Motor Show. First shown as the Concept Car iQ at last year's Frankfurt Motor Show, the iQ will go into production during late 2008. The name iQ is the best representation of what the car embodies. "i" stands for individuality, whilst at the same time also expressing "innovation" and "intelligence". "Q" stands for "quality" and also suggesting that its "cubic" stature gives a "cue" to new value and lifestyle. The marvel of the iQ's ingenuity is in its revolutionary packaging, which is the result of six space-saving but inter-linked engineering innovations that represent a break-through in Toyota's automotive vehicle development. "The iQ story started a few years ago when we at Toyota began thinking of the environmental impact of automobiles. We came to the conclusion that, in order to ensure a sustainable future, there was a need for a radical change in vehicle packaging. We needed to create a break-through, away from the traditional belief that small is basic. Our answer to this is Toyota iQ," says Kazuo Okamoto, Executive Vice President, in charge of Research and Development at Toyota Motor Corporation. 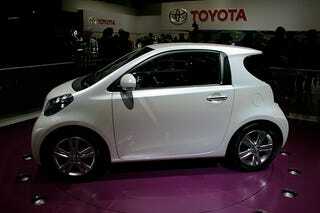 The design of the new iQ has its origin in Japan with J-Factor influences at its core. Toyota explains J-Factor as that aspect of Japanese originality and quality that creates modern, attractive, and globally appealing products from the apparent disharmony and contradictory nature of its original components. Expressions such as 'small yet spacious', 'high-tech yet human' and 'emotional yet functional' are all examples of what Toyota calls J-Factor. Perfect imbalance of proportions: a simple and daring exterior with a strong contrast between the stable and robust stance provided by the iQ's width and the shortness of its overall length. The four wheels - placed at the extremities of each corner - give the iQ a self-assured 'super stance'. At just 2,985mm in length, but with a proportionally larger wheelbase of 2,000mm, the iQ is small in size, but unlike a small car possesses a confident on-road appearance. The iQ's robustness is further enhanced by the tough-looking bumpers. Strong vertical lines define the rear view of the iQ, while the bold rear lamp lenses are divided into three segments by horizontal lines, which help underpin the iQ's strong presence. The iQ is fitted with 5-spoke 16-inch alloy wheels that confidently fill the bold wheel arches. From a rear three-quarter perspective the creative tension continues. A seamless line runs from the edge of the roofline towards the B-pillar and curves around the deep rear glass area, before returning towards the rear hatch and then tailing off at the bold, geometrically-shaped wheel arches. At the front of the car, smoked headlamp units are set deep into the bonnet and wings. Door mirrors with integrated turn indicators further reflect the iQ's refined urban appeal. The 'on-the-edge' exterior styling is replicated in the iQ's refined interior architecture. By mathematically analysing and recreating the structural beauty of natural objects, Toyota has achieved a 'techno-organic' design which fuses geometric precision with inner beauty. This is demonstrated in the floating 'V' centre console, which dominates the asymmetric dashboard. At the base of the V is a single dial that controls the functions of the air conditioning. Creating more passenger space in such a compact vehicle was a key aim for Toyota's design team. The iQ's interior is surprisingly spacious. Six inter-linking engineering innovations are responsible for making this possible. Viewed together, these innovations represent a major milestone in Toyota's vehicle development. The result is a true break-through in 'small yet spacious' packaging, which at the same time has been designed to meet the top 5-star safety rating of EURO NCAP. The new Toyota iQ measures 2,985mm in length and 1,500mm in height, but the car's compact ingenuity lies in its comparatively lengthy wheelbase of 2,000mm. Toyota's ingenious solution to the differential is 3-fold: the under-bonnet area is made more compact; the front wheels can be placed at the very corners of the car, which drastically shortens the front overhang; and the passenger compartment can be increased. The design of the flat under-floor fuel tank has allowed the development of shorter rear overhangs, which contribute to the reduction of the car's overall length. The iQ's innovative asymmetric dashboard was designed to open up the passenger area. Toyota has employed a centre take-off steering gear and positioned it higher in the engine bay. The gear, engine and differential could then be repositioned creating the iQ's size-reduced front overhang. Toyota has been pioneering in the continual search to reduce the car's impact on the environment. Using technology as its cornerstone, Toyota has persistently sought new ideas and new inventions to make the car friendlier to the environment. In addition to Toyota's ongoing Hybrid Synergy Drive® technology innovations, the expansion of its small car range is integral to reducing environmental impact. The new iQ, together with the Urban Cruiser also premiered at Geneva, plays a key role in Toyota's drive to reduce emissions. Both cars are also an essential part of Toyota's challenge to support the Japanese Automobile Manufacturers Association's (JAMA) voluntary commitment of 140 grams per kilometre by 2009.